Shirdi Sai Baba Stories,Leelas and Teachings. 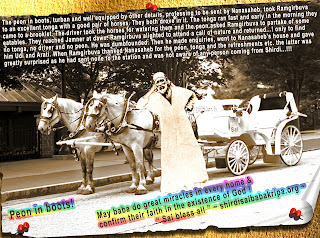 : Shirdi Sai Baba's Grace-Experience Of Sai Devotees-Part 36. 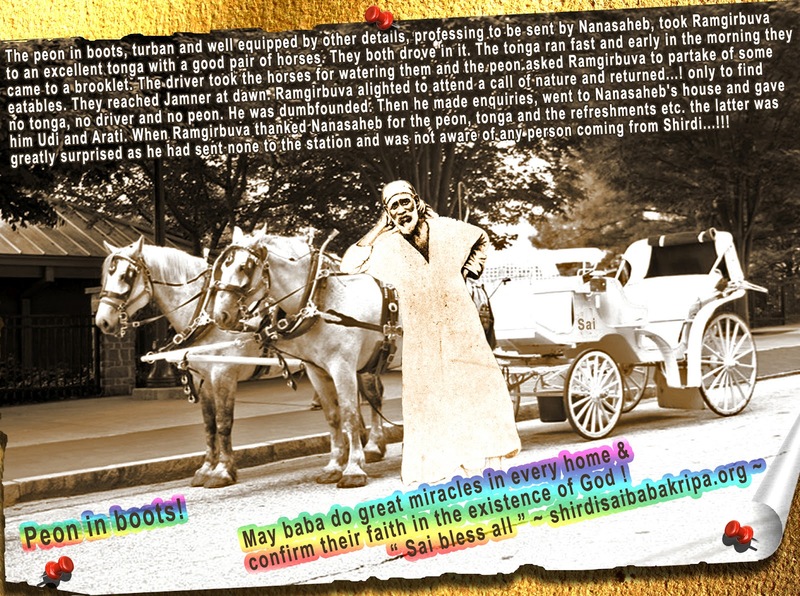 Shirdi Sai Baba's Grace-Experience Of Sai Devotees-Part 36. Bowing to our Saguru Sai we pray and seek His grace. We beg Him to make us worthy of His blessings.As stated in Shri Sai Satcharitra:The Divine light of Guru's grace removes our fear of the daily life,it opens the path of salvation and turns our misery into happiness. If we always remember the feet of the Sad-guru, our troubles come to an end, death loses its sting and the misery of this mundane existence is obliterated. Therefore those who care for their welfare should carefully listen to these stories of Sai Samarth, which will purify their minds. Keeping our faith strong on Shri Sadguru Sai let us read few more leela of Sai Samarth as experienced by His children .Jai Sai Ram . Sairam. Happy Baba's Day to all. Baba's ways are unfathomable while reading devotees' experiences and realizing HIS grace at various moments in life. Manishaji you are one of Baba's chosen child to be a bridge between HIM and devotees seeking guidance from the Holy Authority. With Baba's consent wishing to share HIS leela. In the Holy book of Shri Sai Satcharitha, we have read how Baba cured many diseases by HIS divine medicine, Udhi. More than the Udhi, it is Baba's grace and power that actually cures various maladies through our faith and belief. Like we believe in Gods having form to worship easily with concentration, Udhi is also one such form that keeps us feel comfort when taking it with water. Kindly post the picture of Baba attached. Last week Saturday, about 2 A.M., my sleep was disturbed due to severe pain in stomach. Unable to bear this discomfort, I woke up and between 2 am to 4 am, I was active with bowel irritation, frequent loose motions. At the unearthly hour, I was reminded of the pendency work at office and took myself to task as a lesson to my carelessness. I had to attend office for completing the assignment. There is another person who can handle my work but was officially away. What else a Sai devotee would do, simply accosted Sai and prayed to HIM to help me attend the office without fail to complete and handover the work as assured and rushed to the pooja room, took some udhi with water. Applied udhi externally on the stomach and forehead. Repeating ''Sai Gayathri'' verses prayed to Sai rigorously to give me a peaceful sleep,for the day is approaching shortly. What happened next moment only Baba knows. I went to deep sleep without any discomfort, got up bit late in the morning but found no pains no irritations. Baba made me attend the office amazingly just as a normal day. I did not take any medicine. I felt easy in the morning and did not go to doctor for Baba will indicate that too if i need a doctor but was not at all necessary. I had normal diet excluding oily and spicy foods. 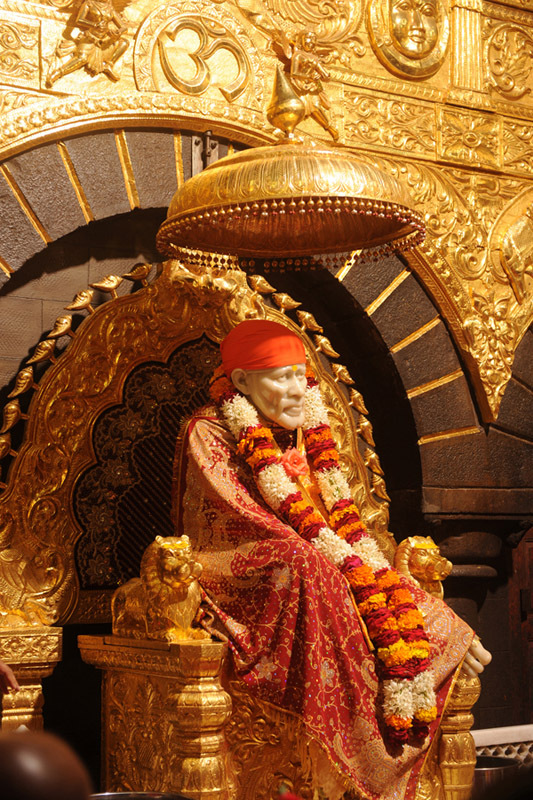 If faith could move mountains, it is not just our faith and prayers to Sadguru Saibaba at times of need but trying to be in constant company with Baba in our thought, word & deed, had never gone void. Certainly BABA takes care of us, sometimes in ways known to us and most of the times we cannot fathom HIS all knowing nature. We have to surpass certain situations but Baba is definitely by our side guarding us always. Here would to like to recollect a story which most of you know. One bakht after being motivated to believe, God resides on top of a mountain, started his journey by climbing the rocky steeped mountains. His unshakeable and blind faith made him slowly reach his hard goal. But he was little proud of his devotion and believed that he could meet GOD, once he climbs up successfully. GOD was after his pride and ego and tested him to realize his mistake. While he was reaching the top, he slipped off and started to slide downwards with all the bruises. It was getting pitch dark due to night. At one point he caught hold of an edge of a rock and was hanging with his energy all the night. When he lost the hopes, suddenly heard a strange voice and that was of God speaking to him. GOD revealed HIS state and asked the bakht to leave off his grip from the rock, giving assurance he would not fall and die. But the Bakht depending on his own wisdom, was not ready to submit himself out of fears and doubts over the GOD who has come for him. As a result he was struggling more. Atlast GOD disappeared for the bakht's non-compliance. The day dawned. To his surprise and joy, the Bakht found himself hanging on the rock just a feet above, from the ground. The Bakht cried of ignoring God's order and presence, prayed sincerely to the Lord to shun his ego, pride and elevate him spiritually. 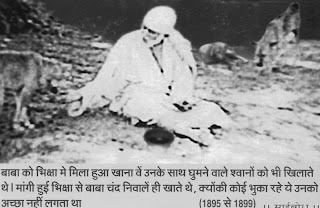 That is how, not only Baba but many saints and self-realized souls, emphasize the humanity about the importance of FAITH with consistent devotion and remembrance (on their favorite God or Guru) and PATIENCE (needed to overcome the sufferings due to past karma) combined with virtues of kindness and generosity while doing the duties honestly, which is the only path to cross the ocean of this mundane existence. Wishing you a happy baba's day.I am a final year engineering student, i would like to share my experience of how baba saved me from death. It was one fine evening that i was returning home from my college in my college bus.The bus travel nearly takes one hour to reach home.My friend, who is a muslim told me lets have a small treat for the day before leaving the college.I agreed. I invited many of my bus mates who are girls.We all got down in moolakadai area of Chennai,we were 8 to 9 members .We all went to a chaat shop and ordered few items and had good fun.After the treat,my friend told me i will take you to my home.I couldn't say no to her and agreed to go with her .She started the scooty and asked me to sit behind .She drove for a short while,later she thought of taking an u turn.I felt I was not seated comfortably in her scooter ,so i told her i will get down.But she assured me and told no.But i thought of getting down while she was not driving the scooty.Suddenly she drove while i was getting down! And she lost her balance and we both fell down.As soon as we fell down we both screamed loudly.And as soon as we fell we suddenly saw a lorry which carries heavy load approaching towards us. This all happened in just a second as soon we both fell and i saw a speeding lorry which was almost in a distance of few inches .I screamed in fear and closed my eyes.That one second i thought i will die and my life is gone but to my surprise when i opened my eyes the nearby people helped us in getting up.We both were in tears and couldn't speak for a second.As we had seen death approaching we were completely numb with fear .To my surprise i did not get any major injury,it was oly a minor thing that my slippers were worn out andmy friend had an injury in her ear with which she got alright that day itself.Tt was only baba who helped me from the jaws of death. The timely help and saving us was none other than the blessing hand of Sai Baba .He is our mother ,our saviour. 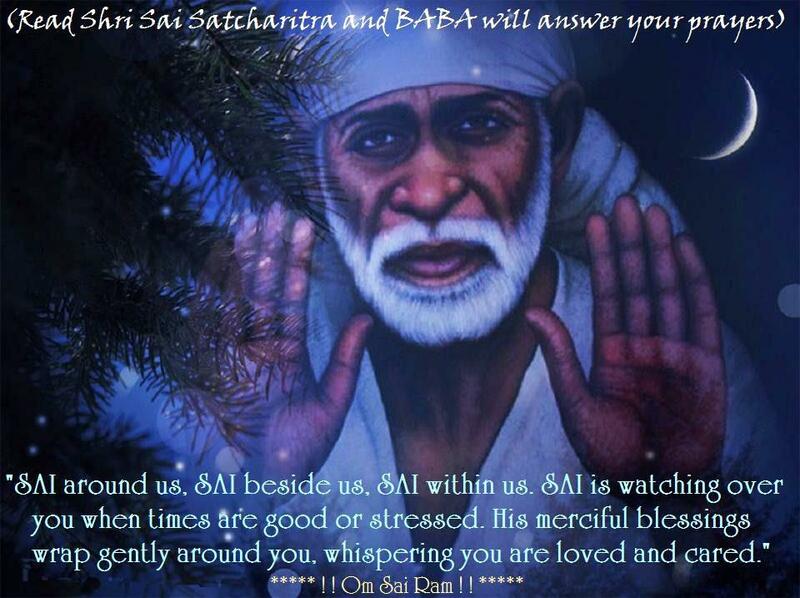 I often have an imagination that we both fell in the hands of baba and it he who saved our life..
Om SaiRam! This is my second experience I am going to share here.My first one was regarding Sai helped in Loan Sanction. That was really wonderful experience. Actually HE has given me lot of small small experiences which was really miraculous. I could say This experience is also a miracle. Kindly correct if there is any mistakes. I would like to start with thanking you for your wonderful work and for having published my first post in your website. On 9th March evening, suddenly my dad planned to go to Madurai Meenakshi Amman Temple and Pillayarpatti( Lord Ganesh Temple which is near by Madurai). He told me regarding the trip and I too agreed to visit those holy places. Mean while I was checking my mails. I dont know why suddenly I felt insecure or some thing bothers me. 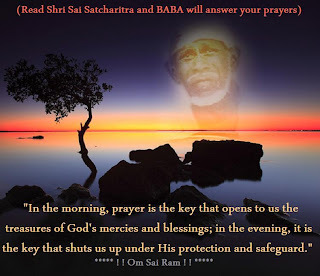 When ever I am sad or some thing bothers me, I used ot visit www.yoursaibaba.com where I get solution through Baba by asking question. So I opened that website and entered a number which came to my mind first. The answer which He gave me was really shocking, surprise and bought gloose flesh. Still I couldn't believe my eyes. Baba said, "YOU MAY TRAVEL. DO NOT START IN THE MORNING. START AFTER AFTERNOON MEALS". I was stunned and realized Sai is always with me and guide's me and its because HIM that i thought of visitng this website all of a sudden. But after reading the answer we couldn't postpone the travel due to certain reasons. I was worried and scared to continue to travel. I took Shri Sai Sat Charitra book and read while travelling(almost 4-5hrs journey) that no harm should bother us. While travelling, twice I realized why baba said not to start in the morning. As driver got up in early morning he was feeling sleepy and while driving we were about to have accident twice. I apologized to Sai for not listening his words and prayed with full faith to save us from the difficulties which are on the way. Also I prayed to Sai to show his picture so that I can feel that HE is with us. I was eagerly looking outside the window for his blessings. After some time I slept off and I dreamt that Iam seeing lots of Sai Baba idols some where. Immediately I woke up and again started to search for baba's photo on the way. Unfortunately I couldn't find him. Safely we reached the Pillayarpatti Temple first (at 11:00 am). We were inside temple for about 1 hour and came out. That time we planned to take our lunch and hence visited a hotel. As soon as we entered, the 1st table was free and we sat there. Beside the table there was a showcase where God's idols, books and other things were kept for sales. The first thing I saw was lots of Sai Baba's idol inside that showcase. I was so happy and out of my excitement I could'nt control and I shouted " OH MY SAI". Few people turned and looked at me. But without bothering that I thanked HIM 100 times for HIS blessings. Those were really cute cute idols where HE looked beautiful and smiling. That moment I thought that I must share my this experience to all Sai Devotees so that other Sai devotee's Faith on HIM will increase. Safely we visited Madurai Meenakshi Amman Temple(where we attend special pooja with HIS grace)and returned home at nite 11:00pm. I thanked baba for being with us through out the travel. What lesson I learnt is a child will be safe and secure when he/she is in his/her mother's warm care. OUR SAI IS OUR MOTHER who care us more than anyone in this world. Also HE is so kind hearted else He would have not forgiven me as I did not listen to his words. I will never repeat this mistake anyday throught out my life. I can feel that Sai is with me and always guiding and taking care of me. He always hear my words and reply to it some how through some or other means. 2. This experience happened on Sangadahara Chathurthi Feb'12(Lord Ganesh day which comes every month). On the same day I was surfing www.shirdisaideva.com website and was reading the articles. Suddenly my mind got struck with a thought that TODAY IS SANGADAHARA CHATHURTHI. INSTEAD OF READING ABOUT LORD GANESHA I AM SURFING SHRI SAIBABA"S Website. IS IT RITE? This thought was running in my mind. With this thinking I clicked one link where I saw one photo and got shocked(I HAVE ATTACHED THAT PHOTO.) In that photo Sai was carrying Lord Ganesh in his left shoulder. And the first few lines written below the photo gave me the exact answer to my questions which was running in my mind. "The lines described that SAI is Ganesha and every one. 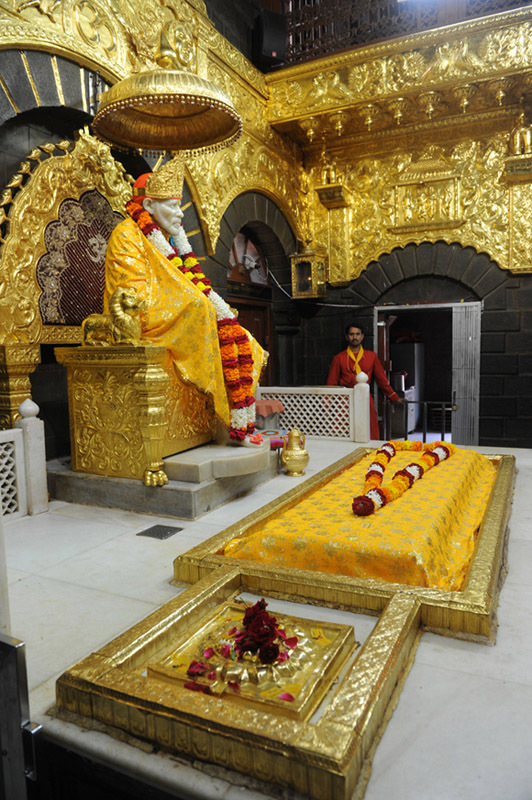 If you wish to see SAI in the form of your favourite God, HE will give you blessings in the same way". I was happy and thanked HIM as well felt sorry for such question arose in my mind. But that was for good because with that one photo HE made me to realize many things. One more thing today I am writing this experience which is also a SANGADAHARA CHATHURTHI for march month. 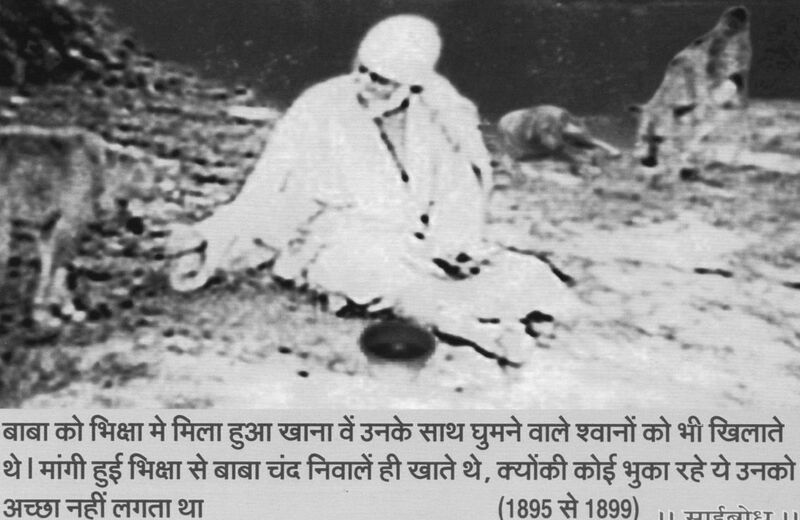 Sai baba's grace is really unexplainable. Really I want to thank HIM from my heart. Thank you SaiBaba. Please bless everyone with your kind heart. I would like to share grace of Sai Baba and his presence in our lives. He is always with us and Omniscient and He knows what is happening where and grant us what we require on the right time. I want to share His Leela we experienced recently. I got engaged by blessings of Sai Baba last year in August. We were looking for marriage date to be fixed up. I wanted Baba to fix the Blessed day for us. We fixed the marriage date as Sunday, 20 November as it was weekend. But Baba had some other plans for me. We couldn't get any possible venue for marriage as they were all booked. So we thought to change the marriage date and again checked with Panditji for the next auspicious day. 1st and 4th December dates were there. Baba wanted my marriage to take place on his Day, i.e. Thursday and it happened! I got married on Thursday, 1st December' 2011 with his Blessings and Love!! There are series of Leelas we experienced during the days of my marriage preparations. My parents and me wanted to give Chola in Sai and Hanuman Mandir before my marriage. My mother went to Sai mandir to give Sai Chola one week before but panditji kept the Chola and asked her to come on 29 Nov to wear Chola to Baba. And it was the Leela of Baba that He wanted to accept the Chola on my Sagan Day. I went in the morning at 6 am and was present in the Snan and Abhishek of Baba and then Chola was worn to Baba. i felt blessed and could not explain the feelings i received there. There was strong vibrations and as if Baba was standing in front of me and gave darshan. Tears came in my eyes and I knew Baba is with us forever. There i met first time the owner of the house and on the ground floor they have made Sai Mandir as they are devotees of Sai. I told him about my marriage and my name. After that i left the mandir. I would here like to tell that I sent my marriage invitation to Shirdi Sai Mandir and prayed Baba to come and bless on my marriage day. Surprises of surprise, Baba again showed his Leela and presence. The owner, Mr Chander Shekhar, I met in the mandir on my sagan day, he came in my marriage venue and met my mother and told her that Baba has asked him to attend my marriage. This all happened as Sai himself in his form came and gave blessings to all of us! He didn't have the address of the venue, i met first time to me and didn't invite him but he still came. I met Mr. Chander Shekhar ji just 2 days before and he narrated me the whole incident how Baba instructed him to attend my marriage. Baba please be with us, my families and always shower your grace, love and blessings in our lives! Baba i bow at your Lotus Feet and pray for goodness of all human beings. First of all a very happy belated holi to everyone including you manisha ji..Iwish to share one small but significant experience and asks for baba's pardon for any mistake while sharing this account with you all. Since this year holi came around Baba's day i.e on Thursday i was thinking if i could visit baba's mandir early morning on Thursday. Since it becomes difficult to commute on the roads during holi but my mom dissuaded me from going saying that you cant go without taking bath because if i would, then i'll have take the bath twice and also she was apprehensive about my safety in festivity. Therefore i dropped the idea of going. Suddenly 5'o'clock in the evening i decided to visit baba's mandir and when i reached baba's mandir i read on the notice board that mandir will be opened at 4'0clock in the evening due to holi.I was relieved thinking baba had planned my visit so that i don't miss visiting Him.Bidding adieu to baba i could sense that baba was smiling and this made me happy too. Next day after the holi, in the morning my mom asked me to bring bread from the nearby store so that she could make sandwiches for the breakfast.Hurriedly i reached the store and took two packs of bread.I was coming out of the store when i noticed that three to four black dogs were sitting around and at little distance, at the entrance of my street there was a small black puppy. I took pity on him since it was cold , but went to my home thereafter.After some 15-20 min later my mom said that the packs of bread are not appropriate for sandwiches so she will return those and bring another, i said I'll return them so she could do some other house hold chores. Iwent to the store and picked another bread packs and was returning when i noticed the same old black puppy .This time i strongly felt like feeding him so opened the pack of bread there and then.And i fed him one bread and made way to my home.. Sorry for lengthy account since i was not counting on words but my feeling which flowed freely while sharing this experience with you all.I know this is a small incident but i hope devotees can understand how Baba teaches us in subtle way and blesses us through these small incidents. I know this is a small miracle but I m sharing it cause I love Sai baba . 1) - One Thursday at my hometown Kota (Rajasthan)during night aarti I was in queue & performing aarti with everyone. After aarti pandit ji was giving flowers to everyone .I said to baba heart of heart "Baba i love you a lot ,and if you love me too then please give the best flowers of yours". I kept watching special flower which was on His Mukut. When i bowed down to touch baba's charan at that time pandit ji was taking off old mala's & that pink rose which was on mukut fall upon me. I had no words and picked up my love of Sai in form of the special rose . 2) Yesterday when i went to my hometown temple there was very long queue and aarti was going to be started.Due to huge crowd and long queue I kept on praying" please please please baba let me come near you to devote flowers before aarti starts.I became so happy when i reached near him before aarti and could offer flower to Him . I LOVE MY SAI BABA A LOT ,HE IS MY EVERYTHING. May Baba bless everyone with full of happiness. 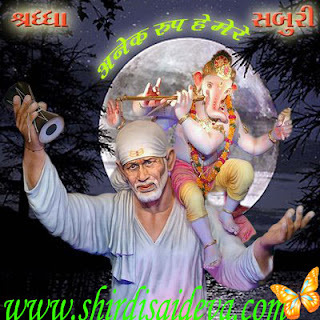 I want to comment on the relation of Shri Sai Baba & Lord Ganesha, it is a mere fact that there is no difference between them & they are one which i comment on the basis of my dream & experiences which i will write on site of Manisha Didi. Fantastic experiences. Reading devotees experiences everyday has become like oxygen for us. It gives us faith and makes us love Him deeply. If not for Baba's grace on sister Manisha,we all would not be blessed with such an opportunity to read and realize the love of Baba.